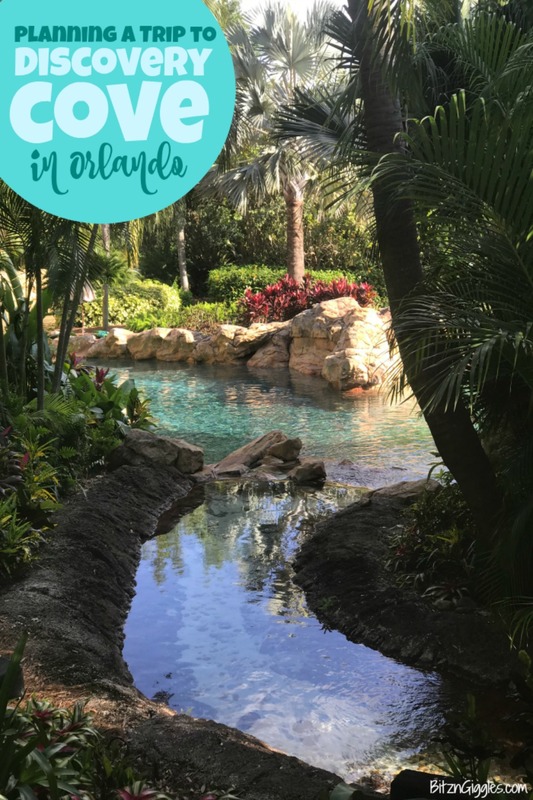 Planning a Trip to Discovery Cove in Orlando – A comprehensive guide on Discovery Cove, with tips for ensuring your family has the best day ever! Our family just returned from a spring break trip to Orlando, Florida. Because we had already visited Disney World a couple years ago, SeaWorld, Universal and Discovery Cove were on our agenda for this year. 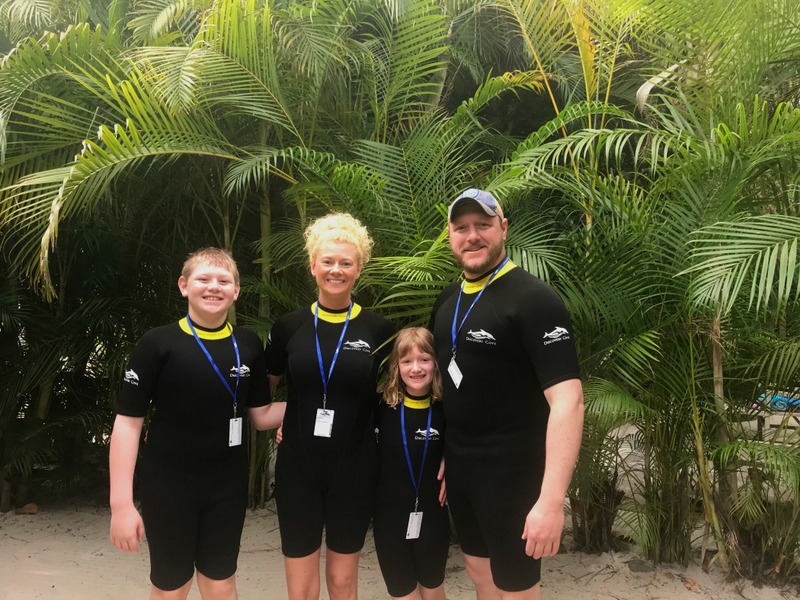 Out of all the places we visited and experienced during our time there, Discovery Cove was our family’s favorite part of the entire trip. I’m always surprised by the amount of people who haven’t heard of Discovery Cove. Some call it Orlando’s best kept secret – and for good reason. Discovery Cove in Orlando is an all-inclusive day resort where guests can enjoy a one-of-a-kind opportunity to swim with dolphins, snorkel among thousands of tropical fish and rays, hand-feed exotic birds, and encounter playful otters. It’s a paradise of rocky lagoons surrounded by lush landscaping, tropical reefs, winding rivers, a resort-style pool complete with waterfalls, and pristine white-sand beaches. Unlike many of the other “parks” in Orlando, Discovery Cove never feels crowded because they limit daily attendance to approximately 1,300 guests. Just take a look at their menu! I know it all sounds too good to be true, and at this point, you’re probably wondering what an all-inclusive day in Discovery Cove paradise really costs. Plan on at least $150-$200/person for standard admission (without the dolphin swim). While it is a bit pricey, there are packages you can take advantage of that include additional experiences for not that much more. For example, we booked a package that, in addition to our Discovery Cove admission, included the dolphin swim and 14-day unlimited admission to SeaWorld and Aquatica. For our family, the day and the experiences there were well worth the cost. One of Discovery Cove’s signature experiences is the dolphin interaction. 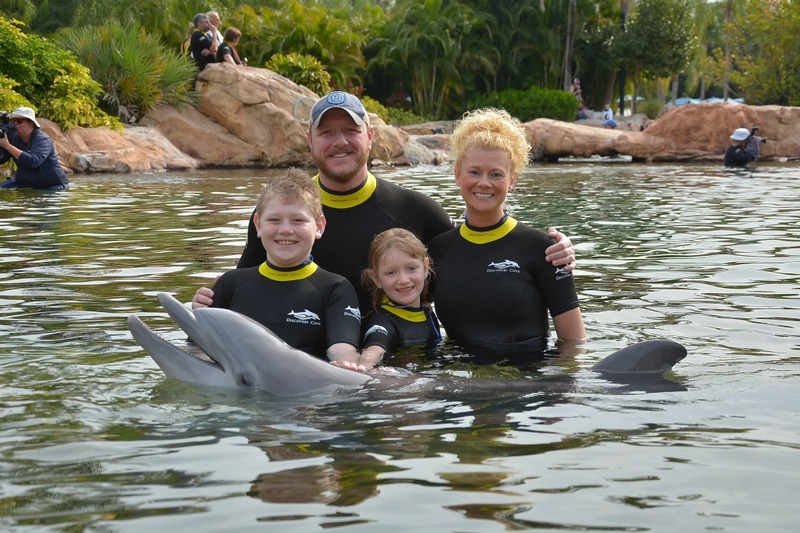 Our family did take advantage of this, and I can say that of the dolphin interactions we’ve done at other parks (and in other countries), this was one of the best. The interactions last about 30 minutes and happen in groups of approximately 7-9 people. The trainers answer any questions you have during the interaction, and you get to touch, kiss, feed and “swim” with the dolphin. In fact, we met two different dolphins during our interaction and got to touch them multiple times. While Discovery Cove doesn’t allow those participating in the experience to bring their cameras or smartphones into the water, family members who aren’t participating are welcome to sit on the “shore” to take photos during the interaction. There is also a professional photographer assigned to each session to capture photos of you and your family. After the interaction, you are walked to the “photo area” where you can view and/or purchase your photos. 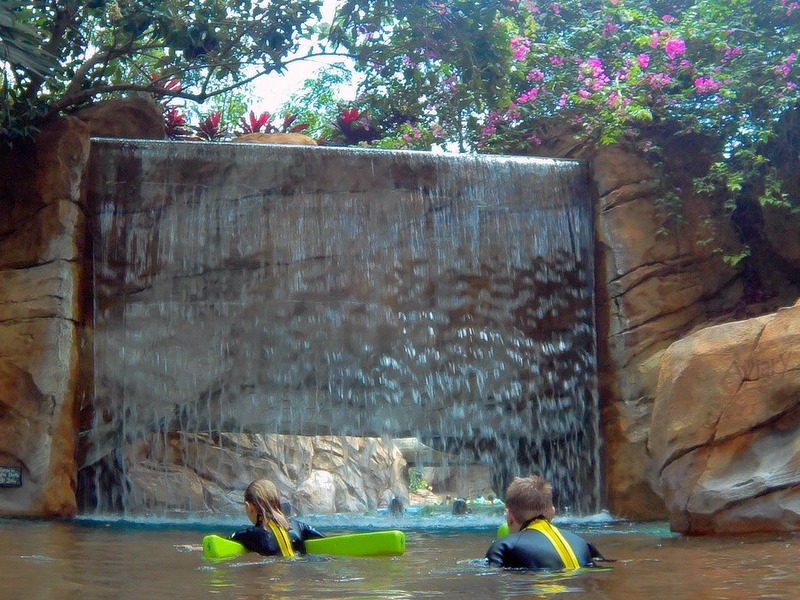 As you would expect, there are even more ways to “upgrade” your experience at Discovery Cove. You can find all the special add-ons here. We decided to reserve a cabana for the day and it was WONDERFUL. It was private – almost hidden – tucked away within the beautiful landscaping. 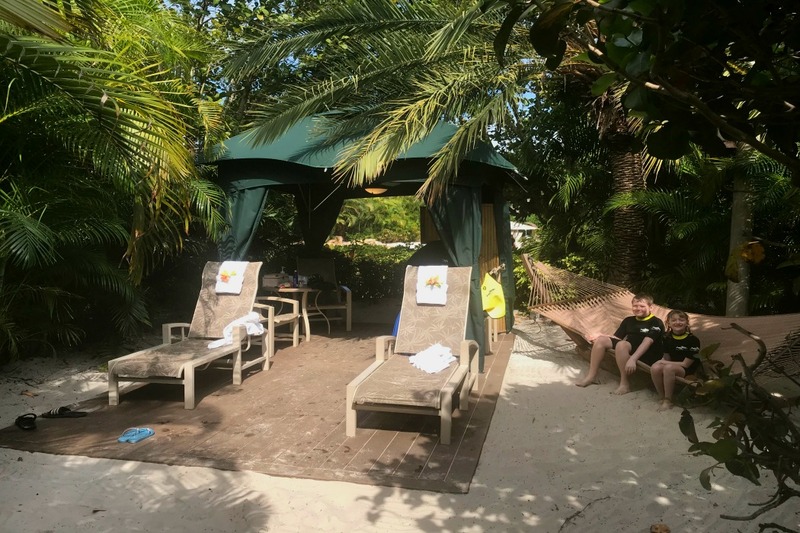 The cabanas are assigned before your arrival, but if there is a certain area you’d like your cabana to be located, you can try emailing guest services at dco-guestrelations@discoverycove.com before your stay to put in a special request. Special requests aren’t guaranteed, but they will make a note on your reservation. It’s worth a shot. Our cabana was located between Serenity Bay and the Dolphin Lagoon. It was close to the restrooms and the breakfast/lunch area. The cabanas include a cabana host/hostess, comfortable seating for up to six guests, a private and stocked refrigerator, private locker, snacks, beverages, and towel service. It’s the perfect place for small children or grandparents to relax or nap while the rest of the family is out exploring. You’ll also be happy to have a cabana in case some rain moves through the area the day you’re visiting. We loved just having a private meeting place and shady area to retreat to throughout the day. While there are plenty of loungers to go around, most are in the sun and unprotected from the elements. Our hostess checked with us many times throughout the day and restocked our towels, beverages and snacks as we consumed them. While you can request snacks and beverages to be brought to your cabana, I’m pretty sure all guests need to go to the actual restaurant for breakfast and lunch service. We never tried ordering anything but snacks or beverages to our cabana, so I’m not certain that’s the case – but from what I observed while there, it’s what I believe to be true. Once you’re on-site at Discovery Cove, there are stationary maps displayed around the park, but as far as a brochure or printed map, they aren’t readily available. It helps to familiarize yourself with the layout of the park before you go. Print out this map beforehand, or put it on your phone before your trip so you can reference it on-site. The Grand reef features multiple levels of exploration, from shallow waters to deeper swimming adventures, from white sandy beaches to snorkeling among tropical fish, rays, and canyons inspired by reefs from around the world. Guests can discover a below-the-surface world teeming with sea life, or they can snorkel in deeper waters as thousands of exotic fish and graceful rays swim around them. Families can explore along the water’s edge or cross a bridge to see sharks swimming below. The Freshwater Oasis features wading adventures and face-to-face encounters with playful otters. Designed with a rainforest canopy above and sparkling clear springs below, guests can relax, explore and find endless discoveries. This free-flight aviary is home to more than 250 exotic birds. Guests can hand-feed hundreds of birds and interact with birds as tall as four feet. 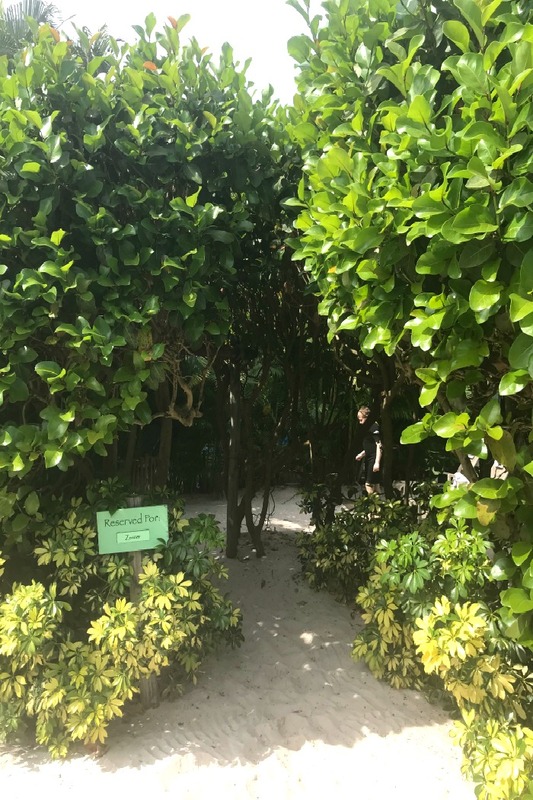 Guests enter the aviary’s lush, tropical environment by way of the park’s beaches or driftingunder the refreshing waterfalls in the Wind-away River. This waterway meanders through the park, encountering beaches, palm-covered walkways and rocky lagoons. Guests swimming through the Wind-away River travel through different environments: a sunny island beach, a dense tropical forest and an underwater cave. Swimmers going under a waterfall will emerge inside the immense free-flight aviary. Flotation devices are provided as the river varies in depth. Sugar-white beaches are lined with swaying palms, tropical foliage and quaint thatched huts. Guests can claim their own spot among the tall shady umbrellas, sunning lounges and beach chairs. Buckets and sand toys are sprinkled along the beach for kids to enjoy. Get to the park early. Plan to arrive between 7:00 am – 7:15 am if you can get your family going. Dolphin interaction times are assigned on a first come, first serve basis, meaning, the earlier you get to the park, the earlier your assigned dolphin interaction. A morning interaction means more free time doing whatever you want the rest of the afternoon. If you reserved a cabana, check in at Guest Services upon arrival. They will send you to the restaurant for breakfast. After breakfast, you’ll need to go back to Guest Services to wait for someone to take you to your cabana.The sooner you finish breakfast, the sooner you’ll be taken to your cabana. At times, waiting for your cabana can take up to 20-30 minutes.Each family that reserves a cabana is fitted for wetsuits, etc. first before they are taken to their spot so you can imagine how things get a bit backed up. If you find yourself waiting, take time to use the restrooms or check out items in the gift shop next to Guest Services to pass the time. A caution to families with young children. 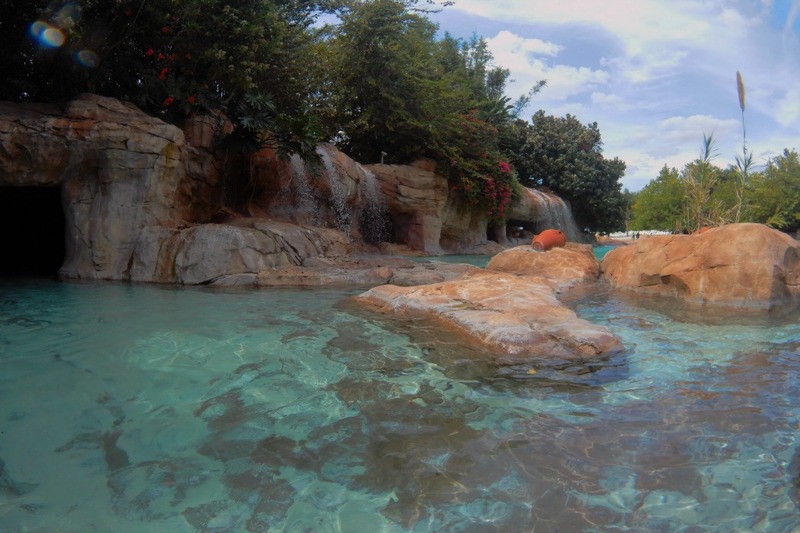 Parts of the lazy river get quite deep at times, the Grand Reef and Dolphin Lagoon are salt water and you are swimming among rays and tropical fish in the reef. These are all things to keep in mind if you have very young children. Life vests are provided for the lazy river but keep in mind that the current can be a bit strong and there are a couple of waterfalls throughout the course that you can’t really “avoid” unless you turn around.You’re going to get wet and the water really “pounds” down on your head unless you swim under water to get past the waterfalls. Most young children do not like salt water, especially once they taste it or it ends up in their eyes.If either of these things happen early on in your day your kiddos may not want to go back in the water. Your best bet is to try to grab some loungers near the freshwater areas of the park. The Grand Reef can be a bit scary for young children. In fact, my 7-year-old was a bit intimidated by the huge stingrays gliding through the reef.Let’s just say that it wasn’t the area she wanted to spend her time. My husband and son spent much more time in the reef than my daughter and I. Children need to be at least 5 years old to participate in the dolphin interaction. Consider a wetsuit AND a vest. You will be given the choice between a vest or a wetsuit upon arrival. I’d recommend getting both.The wetsuits are a bit of a pain to put on, but I’d highly recommend one if you plan to do the dolphin interaction or spend a considerable amount of time in the Grand Reef. The water in these areas is much colder – and you’ll feel it, especially in the morning. The vest is great for the other areas of the park.All of the freshwater areas are “bath water” warm. I’m not even kidding. SO nice. Our family wore wetsuits the entire time and we were very comfortable. Take an underwater camera with you. It would have been a pain to try and lug around our iPhones even in waterproof cases. Instead, we wore this action camera around our necks. It’s completely waterproof and could take both video and photos of our adventure! Consider bringing your own full face snorkel. These panoramic snorkel masks are super cool! They’ve been such a great investment for us. No more dealing with salt water in our eyes or mouths. There’s no need for goggles and a separate snorkel when you have one of these. Don’t wear jewelry. While it’s never a great idea to wear valuables in the water, Discovery Cove will specifically ask you to take off any jewelry or watches if you’re participating in the dolphin interaction. Enjoy breakfast, lunch AND an early dinner. Plan on eating an early breakfast immediately upon arrival to Discovery Cove. Enjoy a “lighter” lunch as close to 11:00 am as possible and try and fit in an early dinner before lunch service ends at 3:00 pm if you really want to get the most out of your investment.Keep in mind that many others have the same idea, so you’ll want to think about getting in line to eat again closer to 2:00 pm. The waterways stay open until 5:00 pm, so take your time, relax and enjoy your day in paradise. If you decide to visit, there’s an excellent chance that Discovery Cove will be one of your favorite stops in Orlando. Ready For More Family Fun?